The Schengen zone was established by the Schengen Agreement and includes today a total of 25 states (22 European Union states and 3 non-EU members). Austria, Belgium, Czech Republic, Denmark, Estonia, Finland, France, Germany, Greece, Hungary, Iceland, Italy, Latvia, Lithuania, Luxembourg, Malta, Netherlands, Norway, Poland, Portugal, Slovakia, Slovenia, Spain, and Sweden. Austria joined the Schengen zone area in 1995; Belgium joined the Schengen zone in 1985. The Schengen Agreement (or the Schengen zone) is not necessarily related to the European Union (i.e. the Schengen zone is not the same thing as European Union). Although many of the Schengen zone member countries are also members of the European Union (EU member states), some European Union members (UK, Ireland) did not sign the Schengen Agreement. On the other hand, some non-EU countries are members of the Schengen zone (Iceland, Norway). 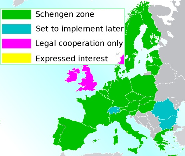 The UK and Ireland are not part of the Schengen Zone. Switzerland, which belongs neither to the European Union nor to the European Economic Area, has been cooperating with the Schengen zone and began implementing Schengen rules on December 12, 2008. The European Commission approved on July 15, 2009 a decision to allow citizens of Macedonia, Montenegro, and Serbia entry to Schengen countries visa-free from January 1, 2010. Bulgaria, Cyprus, Liechtenstein, Romania which are part of the European Union have not yet implemented Schengen zone member rules. How does the Schengen zone benefits the Schengen zone members? Since the implementation of the Schengen rules, border posts between participating Schengen zone countries have been closed. It means that when you travel from one country to the next, you no longer need to stop at the border control to show your passport. The Schengen zone requires participating members to remove all obstacles to free traffic flow at internal borders. Compare the Schengen zone members to the EU member states. Disclaimer: This web page is in no way, form or shape affiliated with any official or governmental organization. Even though we do our best to keep this web site current, information provided on this page may be out dated. Never use this/rely on any private web site to make your personal decisions or take actions. It is your responsibility to check with the appropriate authorities, government, or offices for the most current, relevant, and true information regarding your situation and/or actions. We can not provide any implied, expressed, direct, or indirect warranty or guarantee for information provided on this page, site, or server and for its accuracy and completeness. Reproduction without written permission from the owner of this site is prohibited. Linking to this page is permitted provided that the links are clearly acknowledged. Thank you. Basic fact: There are currently 25 members in the Schengen zone. Switzerland is the latest Schengen zone member.